Our Lego Lord of the Rings walkthrough will guide you through the beginning to ending moments of gameplay with strategy tips for this Action-Adventure video game on the Wii, PC, PS3 & Xbox 360. Lego Lord of the Rings will also be available on 3DS, DS, and PlayStation Vita. Here’s your personal voice-over commentator Doug giving an introduction video! 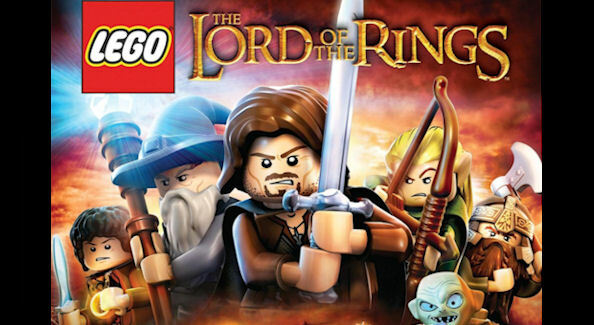 Lego Lord of the Rings is rated PEGI 12 & ESRB E10+ for everyone 10 to 12 years or older. Please note that viewers must be at least that age to watch, so no harm comes to those with innocent eyes. This game includes Cartoon Violence, Comic Mischief. If you need help anywhere, check the FAQ section, or please leave a comment below! How do I find the location of a character, brick or any other item I want to collect/unlock? What’s the story in Lego Lord of the Rings: The Video Game? Based on The Lord of the Rings motion picture trilogy, Lego The Lord of the Rings follows the original storylines of The Lord of the Rings: The Fellowship of the Ring, The Lord of the Rings: The Two Towers, and The Lord of the Rings: The Return of the King, taking players in chronological order through the epic story events re-imagined with the humor and endless variety of LEGO play. Trusted with the dangerous task to destroy an ancient magical ring that threatens all that is good, Frodo is forced to leave his peaceful home. But the ring wants to be found and the road to Mount Doom, the only place where it can be destroyed, will be perilous and riddled with Orcs and fouler things. To help Frodo, a Fellowship is formed — Aragorn the Ranger, Gandalf the Wizard, Legolas the Elf, Gimli the Dwarf, Boromir a Man of Gondor, and Frodo’s Hobbit friends Sam, Merry and Pippin. Players relive the legend through the LEGO minifigures, as they explore wonders, solve timeless riddles, and overcome endless foes in their quest to destroy the Ring. Where do the character voices & music come from? The orchestral music and voice-acting in the Lego Lord of the Rings video game all comes straight from The Lord of the Rings Trilogy of movies. The game uses the original soundtrack and actor’s voices. Although, because of the serious tone of the movies, the game creators have add a lot of (often silent) slap-stick comedy and certain movie scenes have been changed by adding humor to be more family friendly for players. How was Lego Lord of the Rings created? The minds behind the Hobbits’ great adventure show you how plastic, drama, action and comedy come together — with the film’s dialogue. Why does my Xbox 360 game disc say it’s the Demo? Here’s the official statement about what to do: “Warner Bros. Interactive Entertainment is recalling a small number of LEGO The Lord of the Rings video games that were released for the Xbox 360 video game and entertainment system from Microsoft to Walmart, Target and Toys ‘R’ Us in the United States with a disc labeling error. The discs in question are incorrectly labeled as demo discs, but those discs do contain the full game content and are fully functional. This error does not affect any other formats of the game. We are in the process of remanufacturing the discs and will get them to the stores as soon as possible. Additionally, Doug called up Lego and they said the Wii/PS3/PC versions have been delayed till November 27th, 2012. In the Prologue we visit the past, as an alliance of Men and Elves takes on Dark Lord Sauron to free Middle-earth. Morgul Tip: Elendil & Isildur’s sword Narsil can destroy Morgul Lego Objects. They are the objects built from orange glowing bricks that you can smash after selecting Elendil/Isildur from the Character Select Wheel. Saving Tip: Use a Save Statue if you need a rest. Press the action button/key to activate it. Here begins the story of The Lord of the Rings: The Fellowship of the Ring. In Level 1 our Hobbit heroes must avoid “The Black Rider” Ringwraith! Guide Studs Tip: Follow the trail of light-blue/green colored translucent Guide Studs to reach your destination in the Hobbits’ The Shire village Hobbiton. – On the pause menu’s map screen you can set your own destination too, which comes in handy for finding secrets. Map Stones Tip: Map Stones will help you find secrets in the area. Press the action button/key to check these sparkly grey statues. Fishing Tip: Merry can use his fishing rod to fish at LEGO jetties. – When fishing, press the button just as the shrinking circle touches it to win a bonus. Ringwraith Tip: Once you encounter the Ringwraith and get your Ring of Power under control again, distract the Ringwraith by throwing a rock at the bird in the tree, so you can make a safe getaway to the right side. Open World “Middle-earth” Hub Tip: After avoiding the Ringwraith, you enter Bree village where you can talk to the locals to get your first Side-quest. You get this by going to the Prancing Pony inn and helping the Hobbit in front of it to make him a Mithril Trowel. You can do this by going to the Blacksmith in town. Blacksmith Tip: Once you reach the town of Bree, you can go to the Blacksmith there to forge items. Item crafting is new in Lego Lord of the Rings. Visiting him in Bree will unlock the “Mithril Trowel” Blacksmith Design. After completing the Hobbit’s “Mithril Trowel” Side-quest in the town of Bree, set out to find Gandalf the Grey, but instead find Strider, at the Prancing Pony inn. In part 2 of “Level 2: Weathertop” the Hobbits are up to no good cooking 2nd breakfast at the top of mount Weathertop. This is the part of the level where Sam must build fires to protect Frodo. In Part 3 of Level 2 we must pass a dangerous area as Arwen on a horse, while being chased by Ringwraiths, in order to save Frodo and get him healed by an elder Elven! Once we arrive in Rivendell The Fellowship gets together. Note: The first 3 minutes of this last Level 2 video shows the end of the Ringwraiths boss fight. Fire Tip: Switch your character to Sam, who can light a Lego fire. Plants Growing Tip: Sam can use his spade to grow plants from certain Lego soil patches. Bouncing Tip: Hold the action button when bouncing to bounce higher. Cracked Floor Tip: Once he’s available, switch your character to Gimli, who can break Lego cracks on the floor. For example in “Level 9: Warg Attack”, you need Gimli’s axe to break the cracked floor tiles. Water Pools Tip: Pippin can use his bucket to collect water from LEGO pools. The Fellowship of the Ring must pass the dangerous and snowy “The Pass of Caradhras”. In this section we must open The Gates of Moria by solving a puzzle using Legolas’ bow and Gimli’s axe. And then of course have a boss fight with the Kraken monster in the water in front of The Gates of Moria, before we can enter The Mines of Moria. Note: Small characters get stuck in deep snow. Use someone tall to carry the Dwarf and Hobbits through the snow. High Jump Tip: Legolas can jump from tightropes to reach higher places. Arrow Bullseye Target Tip: Legolas can shoot arrows into LEGO arrow slots to create new routes in the level. Arrow Poles & Mithril Gloves Tip: At the start of the game Legolas is the only one in The Fellowship who can jump onto arrow poles. Later on if you’re wearing the Mithril Gloves (not the Mithril Boxing Gloves), then any character can use the arrow poles. Mithril Boxing Gloves Tip: Later on in the game anyone who’s wearing the Mithril Boxing Gloves can pull the yellow handles. Lego Lord of the Rings Walkthrough continues on Page 2 with Level 4: The Mines of Moria.